A TriToon is a Pontoon boat that has a third tube added to the centre of the boat making is sit higher out of the water, meaning that the boat will be able to jump out of the water quicker, Have less resistance, meaning that the boat can use less fuel, have less wear and tear on the motor and achieve higher speeds. The Tritoon package usually comes with lifting strakes and Aluminum under vessel protection. The Starcraft Tritoon boasts a high tech Tritoon package, a beautiful intrior, including a Fresh water sink, Luxurious lounge seating and a high end Stereo System. 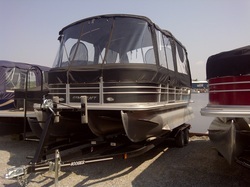 this isn't your grandfathers pontoon boat! 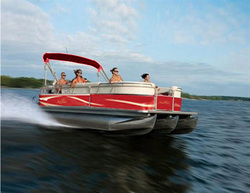 For more information and pricing on Tritoon Pontoon Boats, please click here!